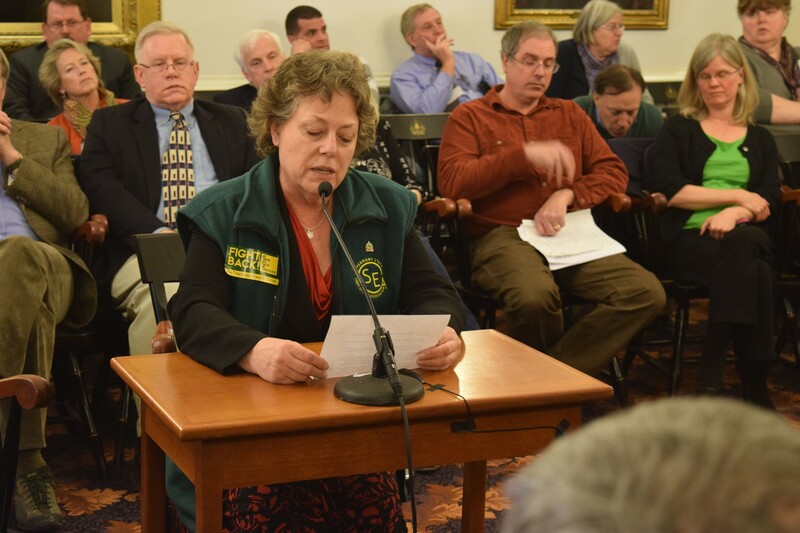 Vermont State Employees Association President Shelley Martin speaks against personnel cuts at a Statehouse hearing earlier this year. Fourteen state employees in eight departments will get official word Wednesday that their jobs are being eliminated. Along with the layoffs, the state also plans to cut another 48 vacant positions in 14 departments. The cuts are part of $10.8 million in state personnel savings intended to help close a $113 million budget gap. “It’s not a lot of fun,” said Agency of Administration Secretary Justin Johnson, whose own office will see two layoffs, which are technically called reductions in force, or RIFs. The 14 employees have likely already gotten a heads-up from VSEA representatives. Under the rules of the state employees’ contract, the VSEA was notified of the positions to be eliminated last Friday. Howard said the VSEA prefers that approach. It allows union representatives to immediately advise workers of their rights, which might include “bumping” less experienced employees or applying for other state jobs. The state will also offer retirement incentives to as many as 300 state employees who are already eligible to retire, which could potentially save $2.5 million next year. The incentives range from $750 to $15,000, depending on length of service. Howard said there seems to be strong interest in the incentives, but those eligible have not yet received the information and no decisions are expected until later in the year. Another $2 million in cuts will come from reducing the use of temporary employees and yet-to-be-determined modifications in pay for exempt, or non-union, employees. That will likely translate to lower pay raises than anticipated, state officials said. The layoffs are a bit of bad news that could have been worse news for the state’s 8,000-person workforce. At the start of the year, Gov. Peter Shumlin suggested there could be as many as 325 layoffs. The tax department will be hardest hit by the layoffs, losing four employees, according to a list provided by the Department of Human Resources. Deputy tax commissioner Gregg Mousley said he couldn’t comment Tuesday on how the layoffs will affect his department. The Agency of Administration, Department of Financial Regulation and the Department of Mental Health are slated to see two layoffs each. The Fish & Wildlife Department, Secretary of State’s Office, Treasurer’s Office and the Criminal Justice Training Council are each losing one employee. Where the cuts were made had to do with which departments had vacancies or other savings they could cut first, according to Johnson. Once all of the job cuts have been made, including through retirement incentives, Johnson said he will talk to department heads about what duties might be eliminated. The state workforce increased 5.6 percent between 2010 and 2014, according to the annual report from the Department of Human Resources. The average annual full-time salary was $54,363.